The instant he spotted her across a crowded EMU Fishbowl, Khalid Al Suhaimi wanted to know everything about Jane Goodwin, a petite, graceful Oregonian who, that day, went on her way unaware of his existence. That would change, but let’s not get ahead of ourselves. This is the story of three alumni whose time at the UO changed their lives in extraordinary ways. For Jane, it would lead to planting seeds of wellness in a culture that lacked fitness outlets for women. For Khalid and his older brother, Aziz, it would transform their outlook on life and business. They would go on to help build their family’s modest regional trading company into an Arabian Gulf conglomerate with diverse subsidiaries in construction, manufacturing, commercial supplies, and services. When Khalid followed Aziz to the University of Oregon in the 1970s, they were among the first Saudis to study in the United States. Though three years apart, they are so similar—with eyes, smiles, and laugh lines that radiate kindness—they could be mistaken for twins. The brothers grew up with seven siblings in Bahrain, an island nation that later became connected to Saudi Arabia by a causeway. As children, they loved the books and magazines their father acquired on trips to Persia and India, where he bought food and supplies for his brother, a merchant in Saudi Arabia. 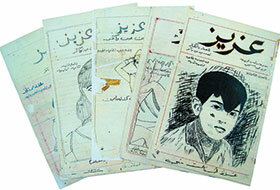 For Aziz, the fascination with books went beyond reading. He created a weekly neighborhood magazine. He drew illustrations, enlisted his sisters as gossip columnists, and built a loyal readership. In 1968, Aziz arrived on campus intent on studying architecture, but soon decided to earn a second degree in fine arts. He remembers watching the sun come up after long nights spent on projects in Lawrence Hall. After graduation, he taught a course in contemporary arabesque art before joining his family’s rapidly expanding business in Saudi Arabia. When he returned to Saudi Arabia, he was obligated to work for the government for as many years as he had been abroad on scholarship. His first job involved inspecting homes for people who needed loans, and helping establish building standards in a country rich with oil but lacking infrastructure. While Aziz was mastering his craft, Khalid was finishing his psychology degree at the UO. One day, he walked into the Excelsior restaurant and spotted the woman he had seen at the Fishbowl. They began dating and discovered they shared similar values regarding family, friendship, honesty, and learning. Both were on strict budgets, but Khalid was eager to impress Jane. To pay for their first date, a fancy dinner at the Rodeway Inn, he used his earnings from weekends playing drums and singing with a band at local nightspots. Jane, a third-generation Oregonian, wasn’t expecting to meet her soulmate. She was busy waiting tables at East Broadway Pizzeria, making tips, and being amazed at how the university was changing her life. “The Spanish literature program was the big ‘wow’ for me in terms of learning,” she says. “I took one class and thought, I love this! I felt successful. I don’t think I had ever been turned on to the process of learning in any of my schooling.” Jane also studied abroad in Spain. Jane and Khalid married three years later and she joined him in Dammam, Saudi Arabia, where he was a troubleshooter for the family’s new ventures. “All that I learned from my professors, especially group and organization dynamics, was very helpful,” he says. As the company grew, he focused on expanding a packaging plant that had been built to provide cans for its paint manufacturing enterprise. 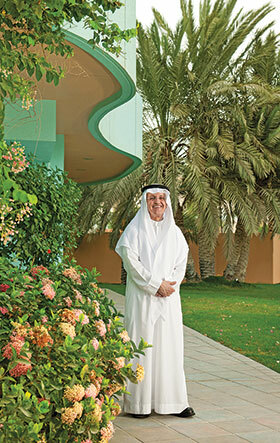 By the time he retired in 2013, the plant was the largest independent can maker in the Middle East, with revenue exceeding $100 million and customers like Nestlé and Kraft. While their children were small, Jane taught aerobic dance. Later, when the family moved to Bahrain, she began dreaming about using music and movement as a way to bring together people of different cultures and nationalities. Khalid loved her vision, and in 2001 they built and opened a local studio, World Beat Fitness Center and Café, with programs ranging from children’s ballet to meditation. “It was a melting pot and a community builder,” Jane says. “We did fundraisers for local charities every year and became very involved in raising awareness about breast cancer.” They even offered free classes for breast cancer survivors, a first in the area. The need hit home in 2006, when Jane received a breast cancer diagnosis. While she went through treatment, Khalid drew on his company’s resources to step up fundraising for breast cancer awareness. “We made special pink cans, filled them with date-filled chocolates, and sold them at a handsome profit,” he says. “We encouraged people to keep them on their desks to help remind women to get their breast checks.” The idea was so successful that grocery stores volunteered to sell the cans. They expanded into other Gulf countries, with all proceeds going to the cause. These days, the brothers and Jane enjoy having more time to travel and relax. Khalid and Jane split their time between Oregon and Bahrain. From his home in Saudi Arabia, Aziz uses his passion for architecture for charitable purposes, such as designing a boarding house for divorced women in India and schools for impoverished children in Asia and Africa. 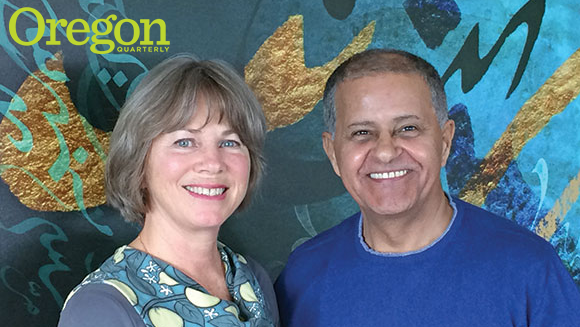 Aziz and his wife, Fawzia, whom he refers to as “my childhood sweetheart and soulmate,” help support the UO’s global engagement programs and funded the EMU’s Al Suhaimi Family Contemplation Room. It’s a quiet place where students can meditate, pray, or enjoy a few peaceful moments. “It helps your mind, a little bit of meditation,” says Aziz, who does yoga every morning. Recently Jane and Khalid endowed a scholarship fund they hope will allow UO students to study, take internships, or conduct research in the Gulf and other Arab regions. —By Melody Ward Leslie, University Communications.